Oh, Asem! I almost shrink at the recollection of the scenes of confusion, of licentious disorganization, which I have witnessed during the last three days. I have beheld this whole city, nay this whole state, given up to the tongue and the pen, to the puffers, the bawlers, the babblers and the slang-whangers. I have beheld the community convulsed with a civil war, (or civil talk) individuals verbally massacred, families annihilated by whole sheets full, and slang-whangers coolly bathing their pens in ink, and rioting in the slaughter of their thousands. I have seen, in short, that awful despot, the people,in the moment of unlimited power, wielding newspapers in one hand, and with the other scattering mud and filth about, like some desperate lunatic relieved from the restraints of his strait waistcoat. I have seen beggers on horseback, ragamuffins riding in coaches, and swing seated in places of honor – I have seen liberty, I have seen equality, I have seen fraternity! – I have seen that great political puppet show – AN ELECTION. The above was a satire written by Washington Irving in Salmungdi Magazine. 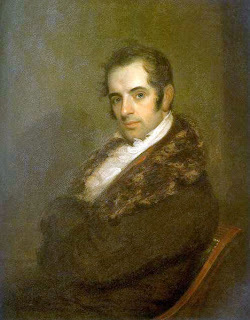 More information: Washington Irving, Salmagundi Magazine, Other Writings.